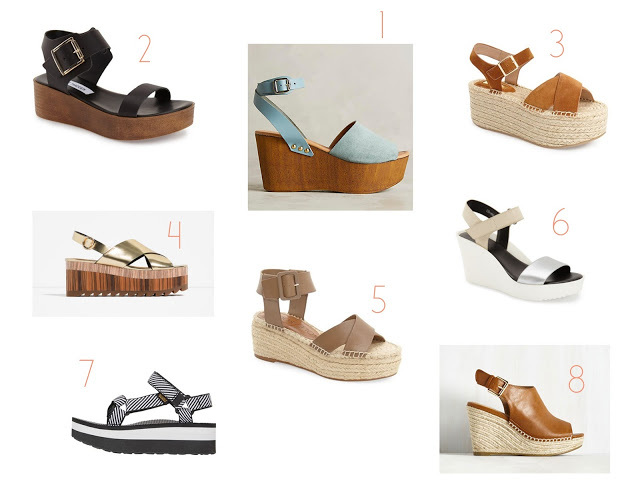 Are you guys drooling over the selection of platforms and wedges out right now like we are? It seems like every time we browse the web or check IG, there is a pair calling our name. To be honest, when the seasons change and it is time to up your shoe game, it is often hard to splurge on trendy pieces that we just can’t see ourselves wearing in everyday “mom world”. What we love about wedges and platforms is that, unlike a heel, you could actually wear these out for a few errands with the kids, a lunch date with your girlfriend, or even a date night with your guy! It is a win win for us! We even love the idea of pairing the Teva platform sandal with your favorite workout leggings after the gym just to take your style up a notch. Here are some practical AND affordable pairs that we are swooooooning over….